Men's Unusual Silver Chain Necklace : LOVE2HAVE in the UK! This piece is a men's unusual chain necklace made from solid sterling silver in a linked style design with a steel finish silver appearance for that authentic urban look. It is 18 inches long and is a great piece of modern men's designer jewellery in silver for an individual look. Each link measures approximately 45mm each x 5mm at its widest point. The links come joined by smaller silver rings, and the total length is 18 inches. We can arrange for other lengths also. We love this necklace with its stylish contemporary curves and organic styling. All the links are of the same long length and feature a tapered curved design. 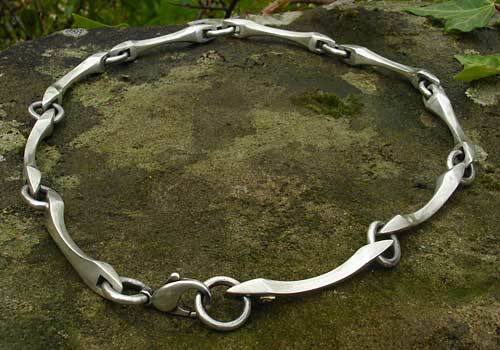 It is a solid quality piece that is handmade here in the UK and unique to if you are a man who likes their silver jewellery to be that little bit more unusual.